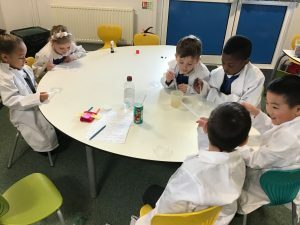 The Reception classes have been busy scientists this week. 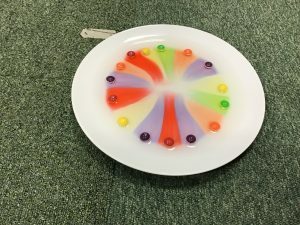 They have learn new vocabulary – science (learning about the world around us), scientist (someone whose job is in science), experiment (having a go at trying something out to see what happens) and prediction (making a sensible guess as to what will happen in an experiment. 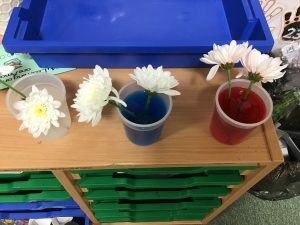 What happened when we put flowers in coloured water? How many drops of water did they get onto a penny? 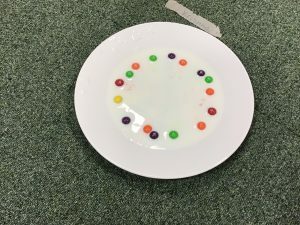 What happened when we put skittles into water? How did we get the electricity circuit to work? You could also ask them what observation skills are. 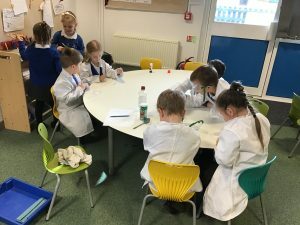 The children also enjoyed 3 Science Assemblies – one about recycling batteries, one with Atomic Tom and another when they met lots of birds of prey. Hopefully they will be able to remember something to tell you.